Waterman Broadcasting purchases JVC ProHD live IP streaming camera. Wayne, New Jersey, May 2016: JVC Professional Video has announced that Waterman Broadcasting, based in Fort Myers, Fla., is updating its camera fleet with 33 GY-HM890 and 11 GY-HM660 JVC ProHD cameras. 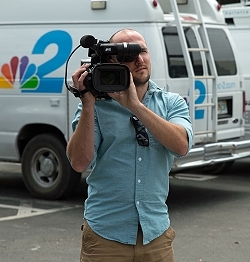 The new cameras will be used for the co-located news operations of WBBH -TV (NBC) and WZVN-TV (ABC), which produce 14 hours of local news per day in Fort Myers-Naples. Waterman has also purchased a JVC BR-800 ProHD Broadcaster, powered by Zixi, to support live video-over-IP ENG reports from the field. The Broadcaster server can receive and manage input streams from multiple ProHD and 4KCAM cameras. According to Dan Billings, Waterman Broadcasting director of technical services, the stations will use a majority of the new JVC cameras for newsgathering and live field reports. He added that now every field camera will have the capability to supplement their current bonded cellular solutions. The new GY-HM660s will be used for Waterman’s multimedia journalists (MMJs). Introduced last month, the GY-HM660 is the industry’s first camera with an integrated IFB audio channel and video-over-IP capabilities, which allow reporters in the field to communicate with the studio while simultaneously delivering live HD reports. Billings said the new GY-HM660s will replace and expand MMJ camera resources, while the GY-HM890s not assigned to the field will be used in the studio. The new cameras represent Waterman’s third major investment in JVC ProHD cameras. The company tested other cameras earlier this year, but preferred the lighter weight and video quality of the JVC models. “Price to performance, there’s just nothing that can beat it,” Billings said.